While shuffling through old videos, I found one I’d almost forgotten about. It’s Andy’s King Christ video in which he talks about his new religious movement and it’s associated charities. This video is especially educational because Andy touches on so many of his numerous scams. He briefly touches on his e-cigarette and then brags that 50% of the proceeds are going to his fake Karma Cause charity. He also brags that used e-cigarettes sold through his now defunct Wiser E-Cig company would be refurbished and donated to homeless shelters (because they’re all just dying to get their hands on more e-cigarettes). 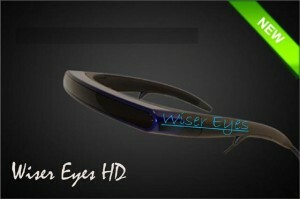 Next Andy talks about his fake Wiser Eyes HD sunglasses, which are actually MyVu Solo EV video glasses and are of course not actually HD at all. I think it’s hilarious how Andy thinks a weak photo-paint job on the MyVu solo product image can fool people, but whatever. He goes on to mention that the sunglasses are 1080p, which of course the MyVu’s are not. The irony is that Andy can’t even afford to buy a pair of MyVu’s to show off in this video – he has to rely on images swiped from eBay. Andy goes on a rant about how he’s going to personally rebuild Solomon’s temple (and Herrod’s temple because he apparently doesn’t know the difference) and allow people to walk through the temple in HD with the Wiser Eyes Sunglasses so the temples will “never be torn down again.” The funny thing about this of course is that the movement is called “King Christ” and one of the main teachings of Christ is that we don’t need to go to a physical temple to worship God because God lives in all of us – even pathological lying sociopaths with felony records like Andy. Finally Andy rounds out his rant by bragging about the Chimera phone, which of course never materialized, and how it along with Andy’s other fake companies, bogus charities and imaginary technologies is going to change the world. At the top of the video you can see that all these world changing, beginning with the launch of the Wiser Eyes Temple, were supposed to have happened last December 21st. The Karma Cause website also mentions the magical December 21st date and claims to kick off the world change campaign with a million dollar donation to humanity (from a guy who can’t even afford to pay his back child support). I wish Andy would give us an update on all his fake charities and how many people they’ve saved. Maybe he can preach to us from the witness box at his own fraud trial – I’m sure that will impress the judge and the jury. Hey Andy, if you’re reading this (and I know you are) don’t forget to have your lawyer tell everybody how many lives you could save if they just ignored all the money you stole and let you go free.